Almost 20,000 barrel bombs have been dropped by Assad regime forces across Syria in the two years since a UN resolution called for an immediate end to attacks on civilians, according to the pro-opposition Syrian Network for Human Rights. A report on Monday documented attacks with at least 19,947 barrel bombs, defying the UN Security Council’s “intent to take further steps in the case of non-compliance” with Resolution 2239. The SNHR said 8,136 civilians were killed in the bombings, documenting names, locations, and dates. The report offers further evidence through photographs, videos, and interviews with witnesses and activists. The first established use of a barrel bomb by the Syrian military was in October 2012, when a two-story building was destroyed in Salqin in Idlib Province in northwest Syria. Most of the bombs have used conventional explosives; however, some have carried chemicals such as chlorine. The SNHR says 99% of the documented casualties are civilians, with up to 35% women and children. 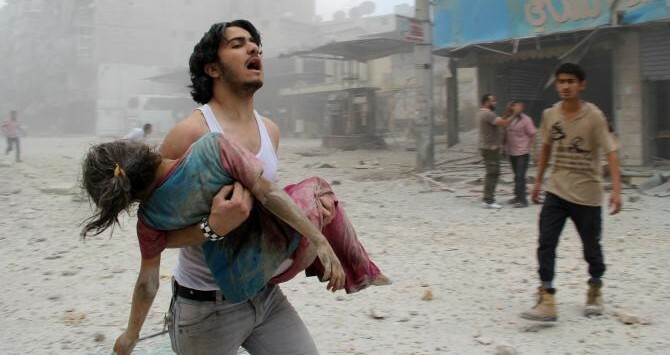 More than 4,700 of the deaths were in Aleppo Province. Although Russia’s airstrikes from September 30 now gain most attention, with Moscow’s attacks the leading cause of death of Syrian civilians in January, the barrel bombings continue: the SNHR establishes more than 5,200 in the past four months.